Update 7 (1942ET): As expected Congress easily advanced the three-week funding bill, and is is now headed to Trump's desk where he is expected to sign it later Friday. So, whether its Ann Coulter or Nancy Pelosi, we suspect someone got up Trump's nose and we suspect that in three weeks, he will not quickly forget it. Update 6 (1638ET): As expected, The Senate has just unanimously passed the three-week stopgap funding bill to end the partial government shutdown. The House is now expected to pass the CR by unanimous consent Friday afternoon, setting the stage for Trump to sign the bill before day's end. Meanwhile, amid what Schumer called "good faith" discussions, The Hill reports that more than 50 House Democrats want to prevent President Trump from using future military funds to build his proposed border wall, even as the president has backed off from declaring a national emergency in order to do so. Update 5 (1600ET): Never ones to miss the chance to gloat, Chuck Schumer and Nancy Pelosi appeared side by side Friday afternoon ahead of what we assume will be a series of votes to pass the compromise bill to reopen the government (followed by three weeks of "good faith" negotiations). During their appearance, they bragged about Trump's decision to come around to the Dems' proposal, and insisted they were "optimistic" that the government wouldn't shut down again. Schumer began the conference by thanking federal employees for working without pay during the shutdown, despite the "callous" treatment of the Trump administration which he said "belittled" workers' financial struggles. Pelosi said that she looked forward to working in a "bipartisan, bicameral way" to pass bills to reopen the government. She also praised Democrats for holding firm on opposing a border wall during the shutdown. "We're grateful to Democrats on both sides of the Capitol for their unity. It's sad, though, that it's taken so long to come to an obvious conclusion," Pelosi said. "Disagreement on policy should never be a reason to shut down the government." Pelosi said she was "optimistic" that the government would not shut down again at the end of the three-week CR. However, she seemed to reiterate her opposition to a border wall. She also said that "the state of the union is not planned now." Meanwhile, some of Trump's most "loyal" supporters were angered by his decision to "cave" to the Democrats...though they sure had a funny way of expressing their displeasure. Update 4 (2:40 pm ET): After keeping what seemed like the entire Washington press corp. waiting for nearly an hour, President Trump took to the podium in the Rose Garden on Friday to announce that he and Congressional Republicans had struck a deal with their Democratic colleagues to temporarily reopen the government for three weeks. But while Trump conceded that the US doesn't need "2,000 miles of concrete wall from sea to shining sea," if Dems don't work with him to strike a suitable deal that would include building "smart walls" in strategic locations across the border - the exact nature of the package will be determined with input from the experts at DHS - he would shut down the government again and call a national emergency to implement his border vision without the help of the Democrats (he started his speech by reminding his audience that he has a "very powerful" alternative..." that he didn't want to use at this time. In what will come as a relief to the 800,000 federal workers going without pay, Trump said he would sign a bill to authorize back pay "as soon as possible." In what was perhaps the most memorable comment from the speech, Trump said he would rely on "smart walls" which he said would do the most to stop drugs and human traffickers from entering the US. 'The walls we are building are not medieval walls, they're smart walls... We do not need 2,000 miles of concrete wall, we never did, we never proposed that we never wanted that...because we have natural structures that are already there and they've been there for millions of years. Our structures will be in pre-determined high risk locations that have been previously identified by the border patrol...no border security plan can work without a physical barrier...it just doesn't happen. The smart walls would be equipped with sensors and other technology...as well as drones. Trump also said he would seek funding for more security at the nation's ports to allow for "quicker and safer" commerce. Finally, it would also include "desperately needed" humanitarian assistance for those being "abused by coyotes - smugglers". In the middle of his speech, Trump launched on a lengthy tangent about human trafficking. Afterwards, the Hill reported that, at one point, a teleprompter in the Rose Garden read "talk about human trafficking" as the president ad-libbed and riffed. Trump tweeted video of his entire speech. TRUMP: AS EVERYBODY KNOWS, I HAVE "VERY POWERFUL ALTERNATIVE"
Trump is leaving his options open to call a national emergency to build the wall if no deal is reached. He also said he would look at border technology including drones. Furthermore, the wall won't be a "medieval" wall but will be a "see-through steel" "smart wall" built in "preidentified strategic areas" with features like see-through visibility. "If we don't get a fair deal from Congress, the government will either shut down on Feb. 15 again, or I will use the emergency powers...to address this emergency. We will have great security," Trump said. Update 2 (1:08 pm ET): Five minutes after Trump was set to begin speaking, Press Secretary Sarah Sanders tweeted that the event has been pushed back to 1:30 pm ET. Fox is reporting that the temporary bill will leave government open for three weeks, through Feb. 15. Though CNBC's Eamon Javers reported that the deal would extend funding through Feb. 28. 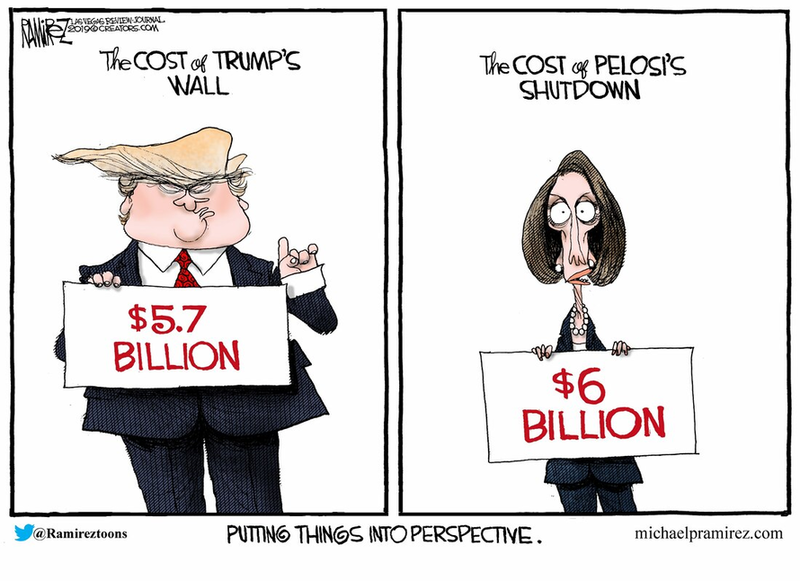 If no deal is reached by then, a national emergency order to circumvent Congress and build the wall is expected. The Washington Post confirmed this, and added that the stopgap won't include funding for a border wall. Mitch McConnell is reportedly planning to pass the stopgap bill on Friday, and a House aide confirmed that Congressional leaders have agreed to advance the bill. The deal reportedly includes "arrangements for negotiations on border security." WSJ reported that the bill would extend funding for border security at current levels - that is, $1.3 billion, but not expressly for a wall. The deal that Trump is reportedly preparing to announce bears some similarities to the Democratic stopgap bill that was one of two measures that failed to pass in the Senate on Thursday (the Democratic measure got more votes than a proposal backed by Republicans). “What we have put on the table is our reputation as legislators, that given three weeks, we’ll come up with a successful conclusion on the border security issue,” said Senator Benjamin Cardin, Democrat of Maryland. ...we'll see how that works out. Update (12:55 pm ET): As White House aides scramble to set up the Rose Garden, President Trump is expected to announce his support for a bill to temporarily reopen the government. Much to the president's chagrin, stocks appear to be moving lower on news that the shutdown might be coming to an end. Of course, the end of the shutdown means a smaller hit to Q1 GDP, which means less chance of the Fed pausing QT. At long last, the government shutdown, now in its 35th day, may finally be coming to an end. According to the Drudge Report, President Trump is planning to announce that a deal has been reached to temporarily reopen the federal government during a hastily organized 1 pm press conference set to take place in the Rose Garden. The press conference was announced mere minutes before Drudge broke the news about the announcement, and follows a hint from Sen. Tim Kaine from earlier on Friday that a breakthrough might finally be imminent. CBS and the Atlantic have confirmed that Trump is expected to endorse a short-term bill to reopen the government. Reporters say the Rose Garden is being set up for a "full blown presidential announcement...complete with teleprompter." Reports on Twitter stressed that the government would reopen "temporarily". The agreement comes after the FAA temporarily suspended flights taking off for La Guardia Airport in NYC and 800,000 government workers missed their second paycheck. 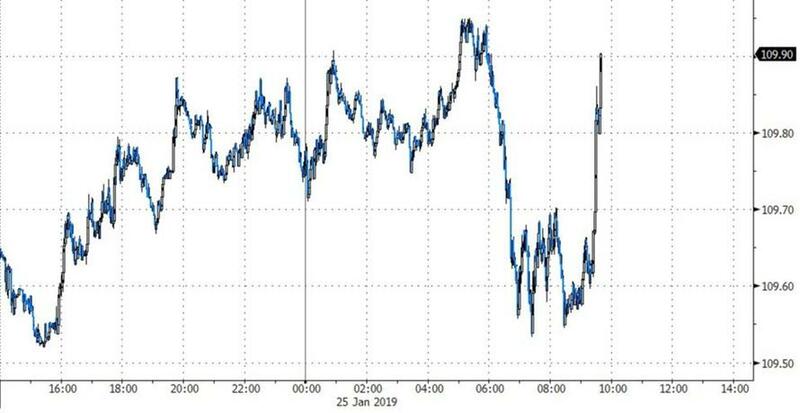 USDJPY is rallying on the news now that several sources have confirmed, though the exact length of the measure isn't yet clear, though CBS said the temporary measure would open the government for "a few weeks." We have yet to see much of a reaction in stocks.